Looking for a new restoration project and look what came up for sale. 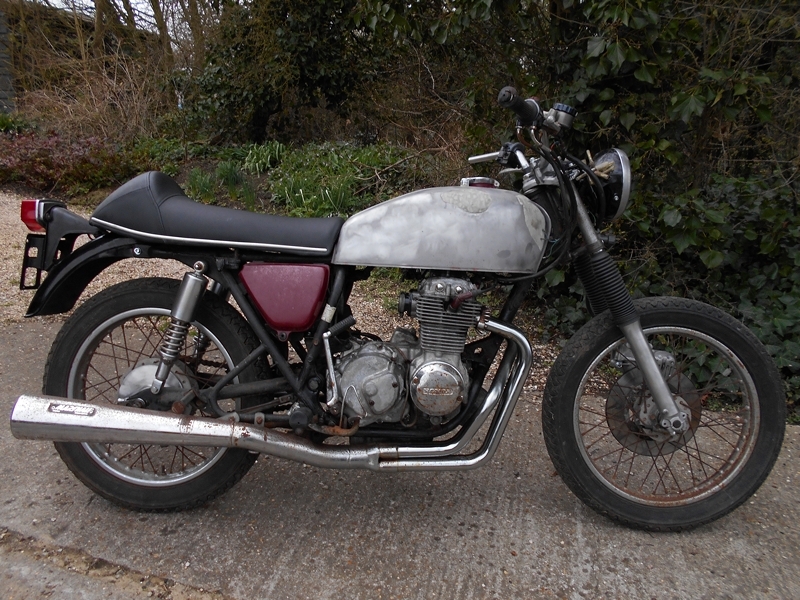 A very tatty but almost complete Honda CB400 4 F2. It didn't take much persuasion to part with some money and bring the bike to the shop. 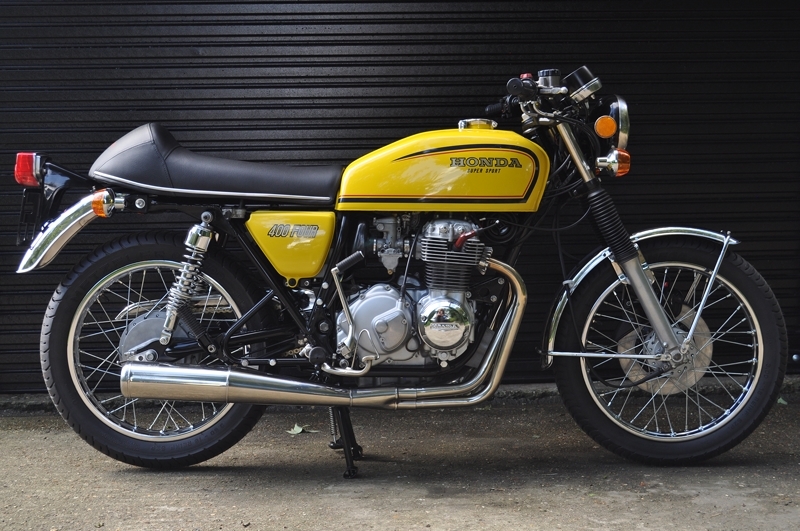 The CB400 F2, the successor to the CB350 with more power and smoother delivery soon became a very popular choice in the late seventies. Along with long swooping 4 into 1 pipes that put it over the triples at the time. Although not as fast as some of its 2-stroke rivals, the 400/4 delivered its power to a top speed of nearly 100 mph with a level of refinement not seen before. As time went by, manufacture of the 400 Four ceased and by the early eighties, machines were already heading for the breakers yards with little interest shown in used models. But, as is the case with so many iconic machines, by 2012, the 400 Four once again sees a revival spurred on by the 55+ male and female bikers who remember with fondness their early biking careers on the 400/4. Just like all of our builds, we strip down the bike and oversee what he have. Sourcing parts and refurbishing many existing parts... the slightly longer duration of this restoration, let us add that extra sparkle that you see on the bike today with approximately 500+ replacement nuts and bolts changed to new A2 stainless Hex. 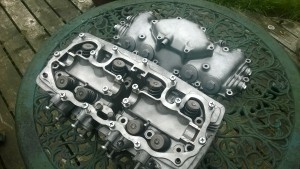 The hex conversion also gives the 400 Four a dash of modern class that you see on sports bikes of today. Although keeping this bike as concourse as possible, we just couldn't help ourselves when sourcing a full stainless Motad exhaust system and Café Racer seat pushing it even further, but subtly into the modern age, appealing to some but perhaps not others... The rest of the bike stays as an original concourse. Wheels are built from the ground up. Hubs have been glass blasted and rebuilt with new sealed bearings built and trued in-house with new polished Galvanised spoke and chrome rims. Brand new Metzeler ME22 tyres sporting great grip and white-line protection offering the rider comfortable and stable handling. With the Instrument cluster showing just over 11,600 miles, this is a genuine low mileage machine with years of life left. The engine has undergone a top end rebuild so that we could glass blast the fins and top cases, we found that the engine had done very little work during its forty-year life, very little carbon to be found in ports or on pistons etc. 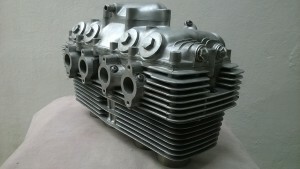 Polishing of various parts was undertaken including valves, cam-shaft, rockers and piston tops. Valves were also re-seated as the bike had been standing for a while. 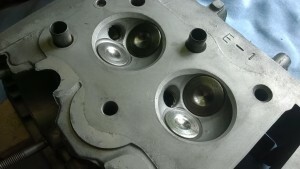 Valve stem oil seals and new gaskets have also been replaced. So here is your chance to own a bike that you know that everything has been done, from re-loomed electrics to fresh paint and everything in-between. Attention to detail everywhere you look. A real classic, one that can look pretty in the living room or a bike to be bombing down the country lanes. As we wait upon a fresh registration, we have decided to showcase this bike is this years Copdock Classic Motorcycle Show, receiving lots of praise and compliments about our work - and also a keen eye from Mr. David Silver himself.